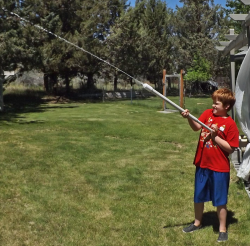 Here is another summer fun project to make with and for your kids: a PVC water gun. Get all your pieces together. Glue the end cap onto the 3/4″ PVC pipe. Glue the reducer to one end of the 1″ PVC. Screw the nylon barb into the 1/2″ side of the reducer. This is the tip of your water gun. 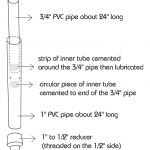 To make a plunger out of your 3/4″ pipe, sand the open side, then sand a strip of inner tube rubber to fit around the pipe (click on the drawing to see the details). Brush contact cement on the pipe and on the strip of rubber and let dry for 10 minutes. Glue the strip of rubber snuggly around the pipe and hold for a couple minutes. Glue a circle of rubber in the same way to the tip of the PVC (optional. You can also stop it up with some plummer’s epoxy. But you don’t really need to close the end of the 3/4″ pipe). Lubricate the rubber part of the plunger and the inside of the 1″ PVC. I used some vaseline jelly on the rubber strip and also sprayed WD40 on the inside of the 1″ pipe. The plunger needs to move freely (but snuggly) inside the water gun. To use the water gun, push the plunger all the way in, insert the tip in water, pull the plunger slowly out until the gun is full of water, and SQUIRT!